Against my usual food blogging beliefs, I’m slapping the Whole 30 label on this super summery post-workout smoothie. Personally, Whole 30 isn’t an approach that works with my food philosophy, but I recognize its value in reducing your intake of sugar and processed “food”, two goals that I can fully support. More importantly, though? I have to support my people! Some friends at Connect Community have taken on the Whole 30 plan with various goals in mind, so I think it’s only fitting that I give them a few recipe ideas this month! As I said, I’m not a huge proponent of the diet myself, so hopefully I got things right and this smoothie actually fits into the diet (conclusion: it does). Before I continue, I’m already feeling the burning negative comments forming out there about why Whole 30 is fine or the best or the devil. This is not a space in which I desire starting a heated debate or to have people yelling at each other, or me, in the comments. Please keep in mind that comments to any effect are always welcome, and as long as they contribute to an intelligent discussion without profanity I will not delete them. Whew, okay, that’s off my chest, so let’s continue. 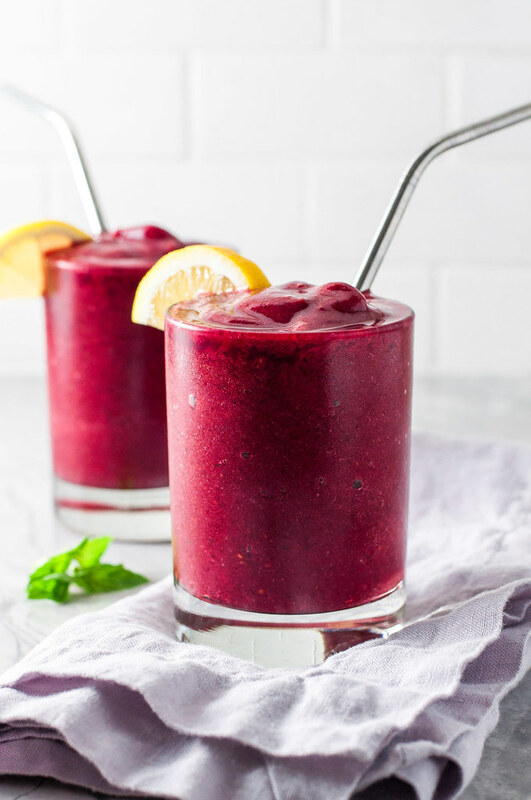 Like my best recipes, this refreshing smoothie came to life without the blog in mind, over a year ago, after a SUPER sweaty run (okay, that’s every time I run) in the summer humidity. It consists of ingredients I had around at the time, and I loved my slightly wacky addition of fresh basil. 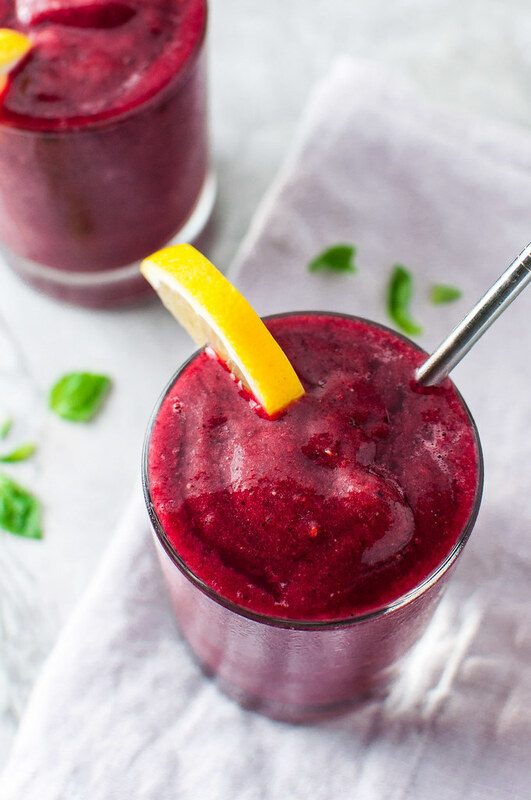 It adds a lovely herbal note to this frosty, slightly (naturally) sweet, antioxidant-packed lemonade smoothie. Give it a try with the basil and see what you think. I’ve found a few tasters who liked it and others (hi Mom) who didn’t care for that aspect, but I promise that if you start with one basil leaf, it won’t ruin the smoothie, and the next time you can adjust up or down from there. 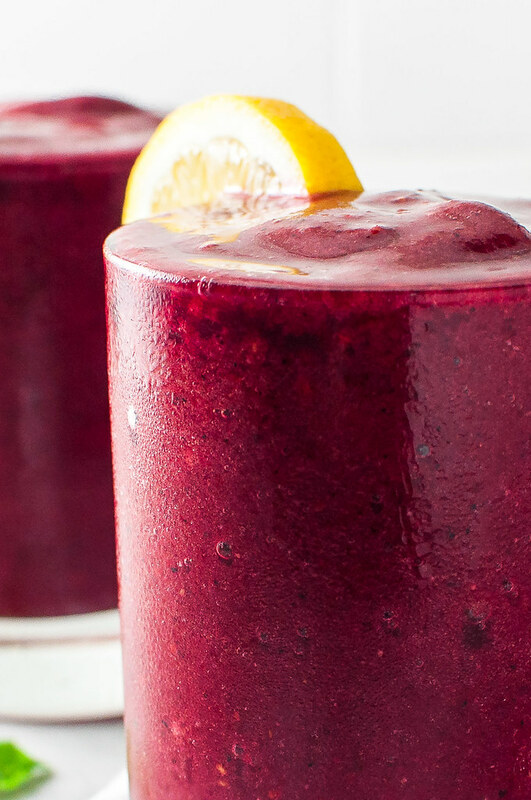 Besides its hydrating and cooling effects, I love the bright, rich hue of the smoothie. I’ve tried it with greens, and while the taste is still wonderful, it totally ruins the color. At the end of the day, this isn’t meant to be some superfood, protein-packed smoothie, so I leave the spinach out of the recipe, but you’re welcome to throw in a handful. If it’s just too stinking hot to work out, this would also be a fun, healthy beverage to go with whatever you’re grilling. I remember when my parents first got their super-powered blender, and sugary strawberry lemonade seemed to come once a week with dinner. Like this smoothie, it was refreshing and light, but I’m pretty sure it came with a hefty portion of sugar, actually draining any of my remaining energy when the temp outside was stiflingly high. Thankfully, I’ve since discovered tender, sweet dates (preferably the larger Medjool variety, which Trader Joe’s carries in their produce section for the best price ever). The internet is wild about stuffing them with cheese, wrapping them in bacon, and baking them until sweet and melty and salty. Not a bad plan, but I prefer to remove the pit of one or two dates, cut them into a few chunks, then toss them into Steve’s or my morning smoothie. Or you could just make both recipes and perhaps the healthy smoothie offsets the bacon-wrapped variety? I’ll leave that up to you. Combine water, lemon juice, and date(s) in a blender and run until opaque with only small bits of the dates visible. With the blender off, add berries, cherries, and basil, and blend at increasing speed until thick and smooth. Serve immediately. 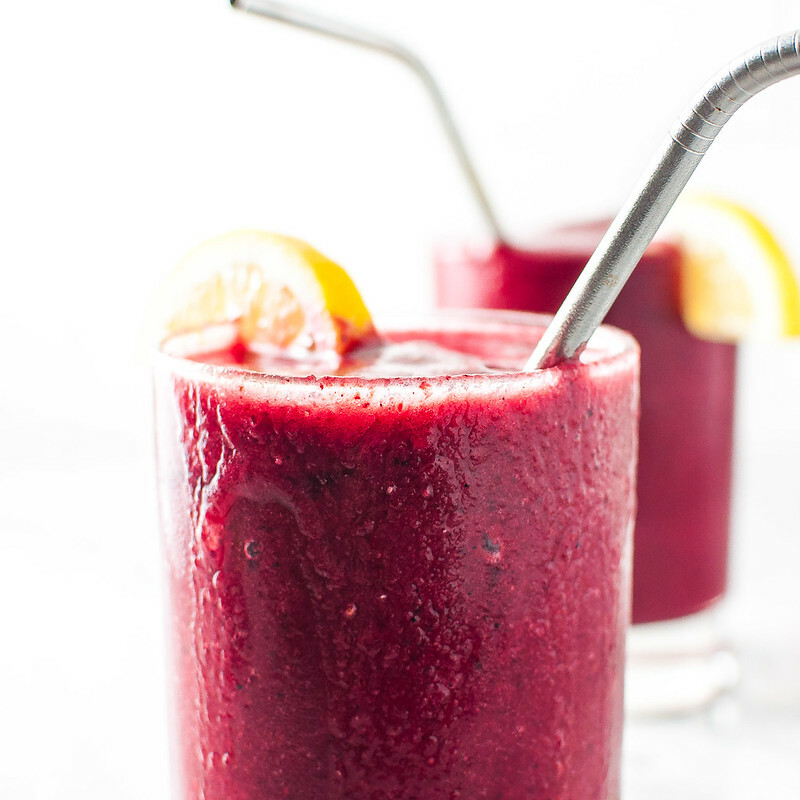 To keep the smoothie extra cold, serve over a couple ice cubes. For a REALLY fun, 21+ party smoothie, you might replace a tablespoon or two of water with vodka or clear, chilled alcohol of your choosing. Note that alcohol of any kind is NOT allowed during the Whole 30 plan. Note: This page contains affiliate links. It does NOT contain sponsored content. 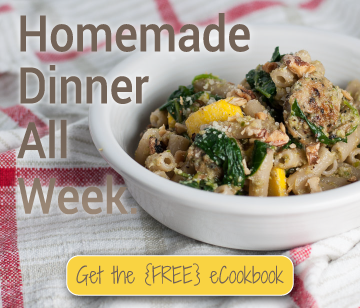 Affiliate links (to products I recommend, on Amazon) offset my ingredient and website maintenance costs, so I can keep bringing you refreshing recipes like this one. Thanks!